Heat oven to 350°F. Place margarine in 12x8-inch (2-quart) glass baking dish. Heat in oven for 3 to 5 minutes or just until margarine sizzles. Remove baking dish from oven; tilt to coat bottom with melted margarine. Place orange roughy fillets in baking dish; turn to coat with margarine. Sprinkle each fillet with basil. Top with tomatoes, seasoned salt and garlic powder. Pour 1 tablespoon wine and 1 teaspoon lemon juice over each fillet. Cover with foil. Bake at 350°F. for 15 to 20 minutes or until fish flakes easily with fork. Remove fish and tomatoes from dish with slotted pancake turner. 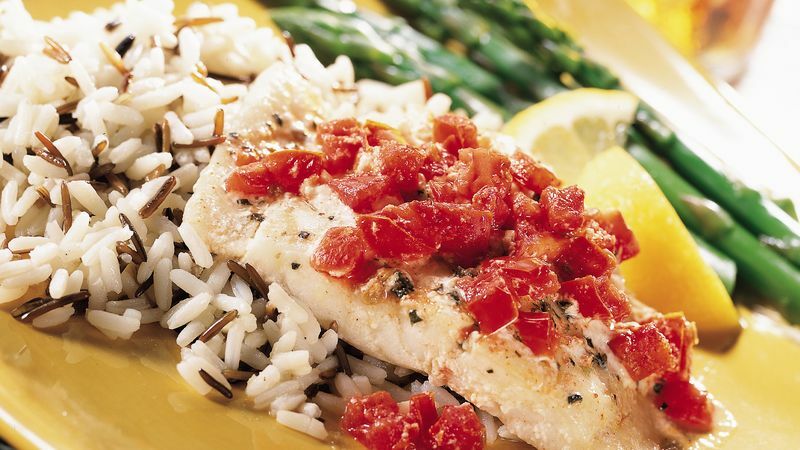 Children can help measure the basil, tomatoes, salt, garlic powder, wine and lemon juice, and then help top the fish fillets. Buy fresh fish from a fish counter that doesn't smell "fishy" or like ammonia, and where fish are displayed on pans set into ice rather that directly on the ice.